Already atop the Pacific Division, the Calgary Flames hope to get even stronger after veteran winger James Neal returned to the lineup Saturday night. Neal, who signed a five-year, $28.75MM deal in the offseason, has struggled in his time with the Flames with both injury and production, posting just five goals in 56 games. However, Calgary hopes they can get the 31-year-old going just in time for the playoffs, giving them another weapon they haven’t really had all season. Neal, who has had 10 straight season with 20 goals or more throughout his career, fared well in his first game back. Neal has one other key statistic — he has 100 games of playoff experience — a quality that few Flames have, which could be another big asset for the team. The debut of Vancouver Canucks top prospect, Quinn Hughes, could be fast approaching as Postmedia’s Ben Kuzma reports that Hughes was out on the ice this morning, skating effortlessly during skills session. The 19-year-old had a recent test that cleared him of having a broken bone in his foot that he suffered with Michigan during the Big 10 playoffs while blocking a shot. The Canucks hope they can get their 2018 first-rounder out on the ice before their season ends. Steve Carp of SinBin.vegas writes that one advantage that the Vegas Golden Knights have, almost guaranteed to be locked into a playoff battle with the San Jose Sharks in the first round, is the team can afford to give injured players some rest. That has been evidenced by forward Max Pacioretty, who landed awkwardly after taking a hit from Winnipeg’s Jacob Trouba on Thursday and is listed as day-to-day and with little incentive left until the playoffs, the team is giving him the time he needs to rest up. The same goes from heavily used Marc-Andre Fleury, who is out with a lower-body injury and has missed four straight games. Even Erik Haula, who has missed most of the season, is skating regularly and could be ready to practice when the playoffs start. 2:52: The Winnipeg Jets announced they have placed Byfuglien on injured reserve. The team is expected to recall a defenseman from the Manitoba Moose, most likely Sami Niku. 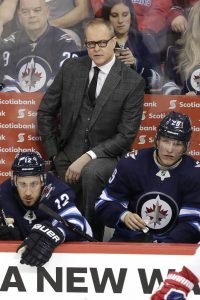 2:06: Winnipeg Jets head coach Paul Maurice said that Dustin Byfuglien, who was forced to leave Saturday in the third period against the Minnesota Wild with a left leg injury, will be out “a while,” until at least the all-star break if not longer, according to Winnipeg Sun’s Ted Wyman. Maurice added that the next update will be at the all-star break, but the 6-foot-5, 260-pound defenseman could be out even longer. “That would be the very earliest part of the window. I don’t know what it’s going to look like in the next two or three weeks,” said Maurice, adding the injury didn’t require surgery. Byfuglien suffered a injury to his left leg when he collided with Minnesota’s Luke Kunin during the third period Saturday and was forced to leave the game. He needed help to get off the ice. Maurice didn’t specify whether the injury was to his ankle or his knee. The 2019 NHL All-Star Game is to take place on Jan. 26, so expect Byfuglien to be out almost a month before an update will be provided. 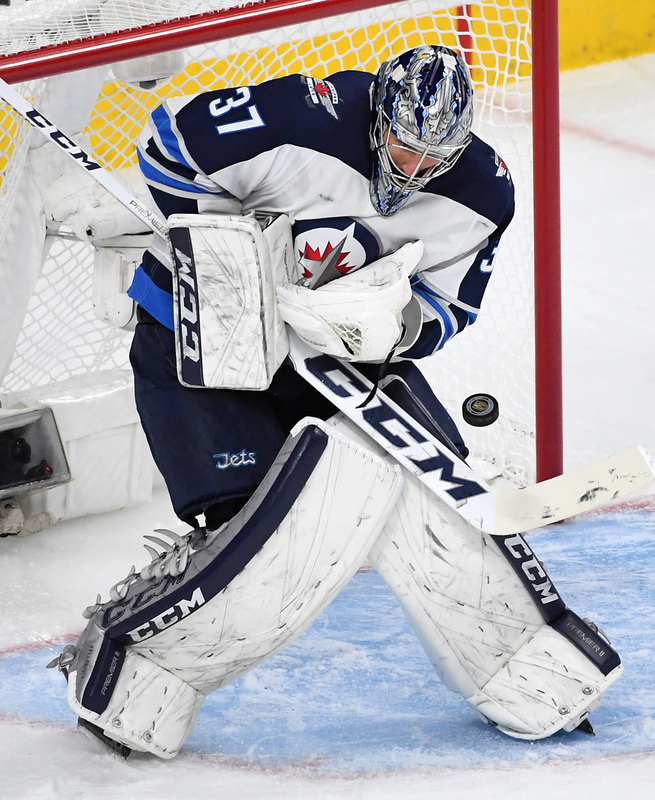 It’s a big blow to the Jets’ defense, who was looking to continue to hold off the Nashville Predators from taking their spot as the top team in the Central Division. 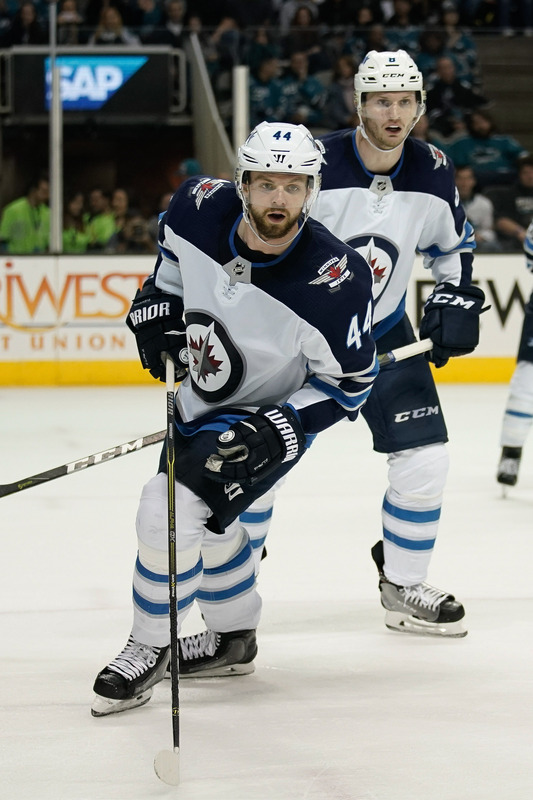 The loss of Byfuglien means the team will lean more heavily on Jacob Trouba, Tyler Myers and Josh Morrissey. However, the team believes they have the depth to succeed without him. Coincidentally, the team hasn’t lost a game without their star defenseman this year as the team is 5-0-1 this year. Byfuglien has already missed six games this season. He missed two games with an upper-body injury in mid-October and then missed another four games with a concussion from Nov. 27 through Dec. 7. It’s expected the team will get back Joseph Morrow today and that Myers is expected to be ready for the New Year’s Eve game in Edmonton. The Winnipeg Jets recalled top prospect Sami Niku this weekend as a replacement for the injured Dmitry Kulikov, and he might get a longer than expected opportunity in the NHL. Kulikov has been moved to injured reserve and is out for at least four weeks according to Ken Wiebe of the Winnipeg Sun. The veteran defenseman suffered an upper-body injury, and will now have to fight his way back on the roster in a month’s time. Kulikov had appeared in just six games this season for the Jets, averaging fewer than 11 minutes per game. That’s a far cry from the expectations placed on him when he signed a three-year $13MM deal in the summer of 2017, one that has not aged well given the rest of the big contracts Winnipeg needs to give out. The team has plenty of cap space at the moment, but will need to hand out deals to Patrik Laine, Kyle Connor, Jacob Trouba and several other restricted free agents this summer. Brett Pesce’s absence at Carolina Hurricanes practice may have set off some alarm bells given the recent speculation about the team’s interest in William Nylander, but Michael Smith of NHL.com reports the defenseman is working through a minor lower-body injury. Pesce won’t play tonight for the Hurricanes, but is listed as just day-to-day for now. Meanwhile in Dallas, Stars’ defenseman Connor Carrick will miss at least three more weeks with his lower-body injury according to broadcaster Bruce LeVine. The Stars are without John Klingberg as well, leaving a lot of the puck-moving responsibility to young defensemen Miro Heiskanen and Julius Honka. Carrick has four points in nine games for the Stars since being acquired just prior to the beginning of the season. Importantly, that trade included a condition that would change the seventh round pick to a sixth round pick for Toronto if Carrick plays in 50 games. An injury like this puts that 50 game threshold very much in doubt. Viktor Arvidsson had just returned from a stint on injured reserve, but is headed back to the shelf after leaving the Nashville Predators recent game against Dallas. Arvidsson has been placed on injured reserve once again, meaning he’ll miss at least a week with his upper-body injury. Sunday: Head coach Mike Babcock said that Matthews will be re-evaluated on Monday, according to NHL.com’s Dave McCarthy. However, Babcock did admit that Matthews will not practice Sunday or play in Monday’s game against Calgary. “He’s not ready right away for sure,” Babcock said. Saturday: The Toronto Maple Leafs got some bad news as star Auston Matthews suffered a shoulder injury during the second period of their game against the Winnipeg Jets Saturday. The center took a big hit (video here) from Winnipeg’s Jacob Trouba and skated off in pain, immediately exiting the game. It didn’t take long before the team announced that he will not return to the game. This marks the third shoulder injury in his career. Any significant injury would be devastating for both Matthews and the team. The 21-year-old Matthews is having the best start of his career, posting 10 goals and 16 points in the team’s first 10 games (not including this one), but he missed 20 games due to injury last year (including a second-degree shoulder separation injury) and the Maple Leafs would like to avoid another long stretch of games without their star center. Matthews also suffered a significant shoulder injury in juniors. Any injury would likely push John Tavares into an even bigger role for the team as well as promote Nazem Kadri to the team’s second line. If Matthews does miss time, it could be a way for restricted free agent William Nylander to get that extra leverage and force the team to hand him a contract closer to the $8MM pricetag that he’s asking for. The two sides have been far apart in contract negotiations as time is starting to run out. A significant injury could force Toronto to add some money to the deal to get him into their lineup as quick as possible to keep their offense rolling. The Colorado Avalanche may be focused on the present, but their future looks bright as well. Not only do the Avalanche have the Ottawa Senators first-round pick this season, which could be a lottery pick despite the team’s success early on this year, the team likes what it sees from Cale Makar, the fourth-overall pick in 2017. The 19-year-old, who is in his sophomore year at the University of Massachusetts-Amherst, has been dominating so far in the early games of the season. UMass reports that Makar leads the NCAA already in points/game with 2.33 as he has three goals and seven points in three games. Makar, who had a good season last year, had just 21 points in 34 games last season, putting him way ahead of where he was a year ago. There continue to be rumors that he’ll sign with the Avalanche after this collegiate season. The Athletic’s Jeremy Rutherford (subscription required) answers questions in a mailbag session and points out that the St. Louis Blues intend to put more responsibilities on the shoulders of second-year defenseman Vince Dunn, who has struggled getting minutes early in the season and has been scratched twice. However, Rutherford writes that the Blues believe he’s been one of their most effective defenders and is likely to receive top-four minutes from now on. Evidently, Dunn suffered through back issues over the summer and wasn’t able to get into top shape before the season started. Now that he’s almost back to the shape he was in last year, Dunn is likely to see an uptick in minutes. He’s already expected to be paired on the top defensive line with Alex Pietrangelo. In a notebook, The Athletic’s Eric Duhatschek (subscription required) writes that Winnipeg Jets defenseman Josh Morrissey is developing nicely after being drafted as an offensive-only defenseman back in 2013. Since then, he’s developed into an excellent shutdown defender and with Jacob Trouba, combine as the team’s shutdown defensive line against other team’s top players. However, when veteran defenseman Dustin Byfuglien went down with an injury last week, Morrissey was given his job on the No. 1 powerplay and still maintains that job despite Byfuglien’s return. Byfuglien has moved to the No. 2 power play role. With the Winnipeg Jets sending 2017 first-round pick Kristian Vesalainen down to Manitoba of the AHL Friday, Moose head coach Pascal Vincent said that the goal is to give the 19-year-old lots of minutes, especially on the power play to get him more ready to eventually return to Winnpeg. “…we want to put him in a position to be successful so he is going to play a lot of minutes and on the power play and I think for his development that’s the right thing,” Vincent said (via Dave Minuk of illegalcurve.com).